It was my mum’s birthday last weekend and we decided to head to a nearby cozy local restaurant for a simple celebration dinner. It wasn’t our first time there so we ordered our usuals and all was well… until my dad started swinging his leg about. He stood up and lo and behold, a cockroach fell out of his trousers. Yes, it crawled into his trousers when we were eating. Disgusted, we decided to get the bill and leave. Followed with the bill, with a 10% service tax and the usual 6% government tax. 1. Treat your customers like customers. Sure, some customers can be a pain and customers are not always right but they’re still your customers. Did you know that for every 1 complaint received, there are 26 others that did not complain, making up to 10,000 dissatisfaction? 2. Avoiding the situation won’t make things better. In fact, it’ll get worse. In the case of Christoforo, let’s just say that his career is over. As for Versace, well, they got a whole lot of blasting themselves from fans and supporters. They no longer are customers who purchase blindly and allows you to get away with things easily. The proof? 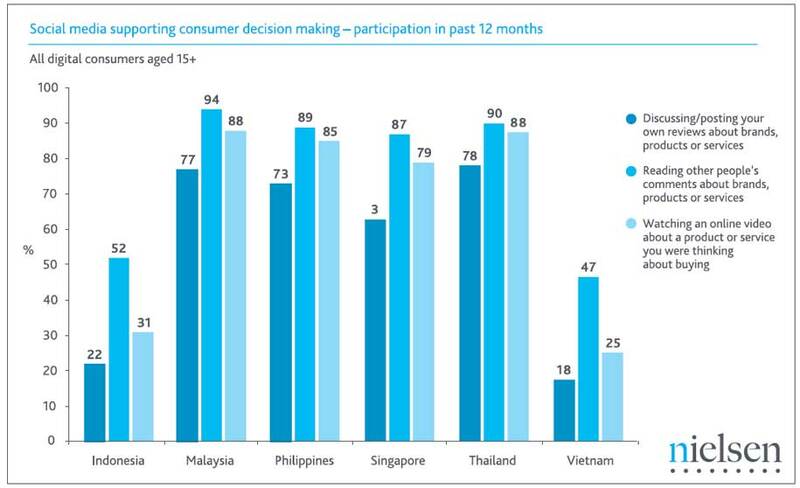 Malaysians actually rely pretty heavily on social networks to receive advice prior to making a purchase. On top of that, 78% of the Malaysian internet population are on Facebook and 31% of them has a blog on Blogger (source: Nielson Research). This also means that if they don’t like you, there’s a 78% chance you’ll end up on their Facebook wall or in a blog post somewhere in the digital world. Not only the complaints are visible to potential customers, they are permanent. And since these content are user generated, you have no way of removing them. A well optimized complaint on a blog will probably guarantee frontage results across search engines. Same goes to negative reviews on FourSquare, Amazon, eBay or TripAdvisor and shared across Facebook and Twitter. Think about it – would you really want that for your business? What if you’re able to turn that around to a positive testimonial instead? Wouldn’t that be good? I’m sure it is. With an experience like that, will we go back there again? We won’t. Will you? I was there when this incident happened and first of all let me say that that was not how it unfolded. You said you were being a concerned customer trying to tell the WAITRESS of the surprise showing of the roach from your dad’s pants. In truth, it was only your dad that went up to the counter in a huff and a gruff on complain about the roach. YOU and your mom were still seated two tables away on the right. Well you were two tables away and you couldn’t possibly hear what she said. I’ll tell you what she said. Know what your dad’s reply was? Well you probably would since you have God-given super hearing considering that you supposedly heard what the WAITRESS said. But conveniently you omitted it from your post because it’s content is unsuitable for public viewing. But in a more subtle way, it goes along the lines of eating at roadsides for 30 years and never ever seen a cockroach. So your next question would be, who am I and how was I so privy to this incident. Well full disclosure then. I and friends with the owners of The Hungry Hog. I was standing behind the counter witnessing this whole drama being played out. Lets just say your dad was not as polite as what you tried to portray. I almost wanted to tell your dad that he was being very rude but decided against it because I don’t run the place and it’s really none of my business. Then you might now think “Oh you were behind the counter, so you must have a stake in the restaurant. No wonder you are so defensive about this whole incident.” Well there are only two stakes I have in this whole scheme of things. Firstly the owners are my friends and anytime they get bullied or wrongly accused, I will come to their defense. They run a lovely restaurant and to have you (or your mother) posting a picture of a cockroach on their facebook page is just plain defamation. And by the way, the picture wasn’t even taken in the restaurant. Where’d you google it from? The second would be to put irresponsible bloggers like you in their place. Yeah customers these days are social customers but that does not mean that just because they have a nice spiffy looking blog site and have 30 followers *snigger*, whatever they say is the gospel truth. Irresponsible bloggers like you constantly try to tilt the balance of opinions to your side by exaggerating facts and conveniently omitting the inconvenient truths. You are not bounded by the rules of conventional journalism so you write anything in a way to portray yourself as the hero, or the victim, whichever you see fit. But never the perpetrator. That would be blogging suicide. But this is your blog . You’re free to pen out your opinions, your experiences, your whims and fancies. But when it’s available for the world to see, be prepared for some criticism. Get off your high horse and blog responsibly. Once again, thank you for sharing your part of your experience of the incident at the scene too. First and foremost, I’m sorry for having you get the wrong message out of my post. I have no intentions in pointing fingers, just wanted to share a brief experience and how it can relate to other businesses as a case study like what I’ve been doing in most of my articles. It is definitely not intended to be a food review, unlike the many food bloggers around. You are right to say that I was at the table when the incident happen because I, like yourself, did not want to make a scene, especially when it is not our first time at Hungry Hog and we generally enjoy the food there which is why we decided to celebrate my mum’s birthday at the restaurant. We were just disappointed that the matter was ‘solved’ in a very dissatisfying manner in which it could be done better. And I personally did hear the waitress saying “I just on in so i didn’t see what happened” though I did not mention she answered rudely. On the other hand, it is only natural that my dad would be angry especially in a proper restaurant where cleanliness is key – simply because he was the victim of the incident and I’m thankful that you decided to keep it low. I’m sure most customers will feel uncomfortable / disgusted in similar situations. However, I would also want to point out that even so, it will be great if your esteemed restaurant was able to manage the problem a little better than what happened. As for the picture, I am unaware of it being posted as I always give credit to the pictures I use on my site therefore I can’t say if it is real or Googled. However if it is untrue, I sincerely apologize on my mum’s behalf. Perhaps she was just acting out of disappointment (after all, it was her birthday that was ruined). Regarding my blog, I appreciate your honesty and perspective. Although it may be true that I may not have thousands of blog followers like others may have, but I’m merely writing because I enjoy what I do and with the support of the community I’m in. Again, I’m sorry that the article’s content resonated negatively with you as it was never intended to portray social customers as people with ‘gospel truths’ (and not targeted directly at Hungry Hog). The truth is, these customers can be a whole bunch of liars too. Having said that, it is also important for businesses of any industry to be aware of what’s being said of them and react carefully due to the ease-of-use and wide penetration of social media platforms. Thank you again for your thoughts and taking the time to leave a comment on my humble site. It is much appreciated. When faced with a negative customer experience, you have an opportunity to turn it into something positive both for the customer and the restaurant. She could have fixed the experience: free drinks, discounted meal, vouchers to return again. Instead, by brushing off the situation – the restaurant, and it’s owner’s friends seem to have inflamed it. Even if the patrons hadn’t been prominent bloggers, the potential gain for the restaurant for having happy patrons would have been much more lucrative than the fall out from having frustrated and patrons who felt they had been unfairly treated. Haha I like how you made the cockroach the hero (after all he was brave to venture into new ‘land’). On a more serious note, I agree that the situation could be diffused into a positive experience instead and it’s not that we needed a discount or a free drink, but it’ll be excellent even if they only checked up on the customers to see if everyone is okay before leaving. The F&B industry is very tricky to deal with. Not only they’ve to ensure the quality of the food and service, they’ve to also pay close attention in creating positive customer experiences and it’s never easy. We’ve a client that is also struggling with social crm but fluid improvements are made everyday. By reading your story above, I am sorry to hear that and yet you got the right to express your unsatisfied feelings. But I am hereby to announce that you are not allow to use my picture to express your feelings. Kindly grab your own camera or own phone to snap a picture for yourself! You are ruining my image! Hi again, please to tell you that if you got proof and enough evidence, example: pictures and source. Please complain it to MPSJ, it is useless to tell only words above and without image provided, it is hard to gain trust from your audience. If you know how to read Chinese/Mandarin, please read the article links. It is about a Taiwan Blogger how she get sued and what kind of shits she gets in her pants. Please remember the photo I mentioned earlier. I am pretty sorry for spamming you again. You know I got some bad experience from some food store. Example: The Frames, locate at Sunway Pyramid near Starbucks (now become Brozeit). I got a very awful dinning experience and I got 40friends with me that time, the next day morning I got this morning call from this very friendly Manager from The Frames. He say that he will treat us one more time again for 40 all of us. I was very satisfied and of course very happy and yet I don’t remember writing them at all. You write this post, is to let them know that your existence, and they really DO deserve this kind of post. But your proof is too poor dude.